M. V. Lomonosov Moscow State University (Russian: Моско́вский госуда́рственный университе́т и́мени М.В.Ломоно́сова, Moskóvskiy gosudárstvennyy universitét ímeni M. V. Lomonósova), for a time the Lomonosov University or MSU (Russian: университе́т Ломоно́сова, Universitét Lomonósova; Russian: МГУ, MGU), is the largest university in Russia. 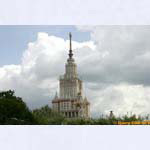 Founded in 1755, it also claims to be the oldest university in Russia and the tallest educational building in the world. As of 2004, the university has some 4,000 staff teaching 31,000 students and 7,000 postgraduates. Its current rector is Viktor Sadovnichiy. In 1940, the university was renamed in honor of its founder, Mikhail Lomonosov. The establishment of the university was instigated by Ivan Shuvalov and Mikhail Lomonosov, and the decree ordering its creation was issued by Russian Empress Elizabeth on January 25 (January 12 old style), 1755. The first lectures were held on April 26. January 25 is still celebrated as Students' Day in Russia. 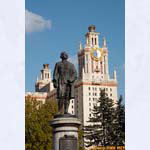 It is disputed whether Moscow State University or St. Petersburg State University is actually the oldest higher education institution in Russia. While the former was established in 1755, the latter, which has been in continuous operation under the moniker "university" since 1819, claims to be the successor of the university established on January 24 1724 by a decree of Peter the Great together with the Academic Gymnasium and Saint Petersburg Academy of Sciences. Originally located in the Principal Medicine Store on Red Square, the university was transferred by Catherine the Great to the present Neoclassical building on the other side of Mokhovaya Street. The main building was constructed between 1782 and 1793 in the Neo-Palladian style, designed by Matvei Kazakov, and rebuilt after the Fire of Moscow (1812) by Domenico Giliardi. In the 18th century, the university had three faculties: philosophy, medicine, and law. A college for future students was affiliated with the university before being abolished in 1812. In 1779, Mikhail Kheraskov founded a boarding school for noblemen (Благородный пансион), which was transformed into a gymnasium for the Russian nobility in 1830. The university press, run by Nikolay Novikov in the 1780s, published the most popular newspaper in Imperial Russia — Moskovskie Vedomosti. In 1804, medical education was split into Clinical (therapy), Surgical, and Obstetrics faculties. In 1884-1897, the Department of Medicine, supported by private donations, City Hall, and the national government, built an extensive, 1.6 kilometer long, state-of-the-art medical campus in Devichye Pole, between the Garden Ring and Novodevichy Convent. It was designed by Konstantin Bykovsky, with University doctors like Nikolay Sklifosovskiy and Fyodor Erismann acting as consultants. The campus, and medical education in general, were separated from the University in 1918. Devichye Pole is now operated by the independent Moscow Medical Academy and various other state and private institutions. In 1905, a social-democratic organization was created at the university calling for the tsar to be overthrown and for Russia to be turned into a republic. The Tsarist government repeatedly began closing the university. In 1911, in a protest over the introduction of troops onto the campus and mistreatment of certain professors, 130 scientists and professors resigned en masse, including prominent figures such as Nikolay Dimitrievich Zelinskiy, Pyotr Nikolaevich Lebedev, and Sergei Alekseevich Chaplygin. Thousands of students were also expelled. After the October Revolution in 1917, the school began allowing the admission of children of the proletariat and peasants, not just those of the well-to-do. In 1919, tuition fees were abolished, and a preparatory facility was created for children of the working class so that they would be able to pass the admission examinations. The political repressions of the 1930s and 1950s severely limited the development of scientific ideas, as Soviet scientists had virtually no contacts with their colleagues abroad. Certain branches of science (e.g. genetics) were condemned for being based on anti-Communist ideologies, and a number of scientists and scholars were sentenced to life imprisonment. World War II (known in Russia as the Great Patriotic War) was one of the most difficult periods in the history of Russia. University students and staff began to enlist in the army on the third day of fighting. One of the divisions formed out of University volunteers fought defending Moscow. 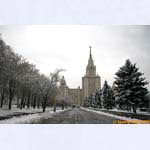 Many Moscow State University professors, students, and staff were evacuated during the war first to Ashgabat, Turkmenistan, then to Sverdlovsk, returning to Moscow in 1943, after the German troops were defeated near the capital. During the war, over 3,000 specialists were trained at the University. University scientists continued their research, and their contributions to applied science allowed improvements in aircraft development, the accuracy of artillery fire, etc. Also, new explosives were invented, a study of uranium was carried out, a blood coagulant was introduced into medical practice, University geologists discovered tungsten and new oil deposits in Central Asia, and University geographers supplied the Red Army with maps and charts. University lawyers made their contribution during the Nuremberg and Tokyo trials. 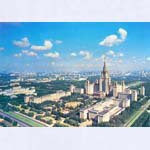 During the post-war period, the leading role of Moscow State University in the restoration and further development of the country was fully recognized. There was a fivefold increase in state funding, and a new University campus was built on Vorobievy Gory (Sparrow Hills), where all the lecture halls and laboratories had the most modern equipment available at the time. After 1991, nine new faculties were established. In 1992, the university was granted a unique status: it is funded directly from the state budget (bypassing the ministry of education), which provides a significant level of independence. On September 6, 1997, the entire front of the university was used as the backdrop for a concert by French electronic musician Jean Michel Jarre, who had been specially invited to perform there by the mayor of the city. The entire front of the building was used as a giant projection screen, while fireworks, lasers, and searchlights were all launched from various points around the building. The stage was directly in front of the building, and the concert, titled "The Road To The 21st Century" in Russia, but renamed "Oxygen In Moscow" for worldwide video/DVD release, attracted a world record crowd of 3.5 million people. On March 19, 2008, Russia's most powerful supercomputer to date, the SKIF MSU (Russian: СКИФ МГУ; skif is Russian for "scythian") was launched at the university. Its peak performance is 60 TFLOPS and LINPACK is 47.170 TFLOPS, making it the fastest supercomputer in the CIS.